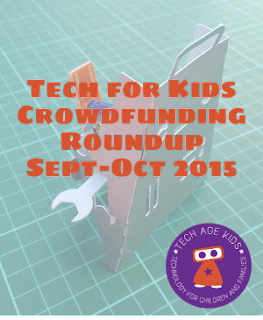 Time for our monthly roundup of kids technology projects that are looking for crowdfunding. Many of these projects will be available to back well into October 2015, some are ending sooner that others so make sure you check the dates. September 2015 has been a fantastic month for crowdfunded children's robots and also for physical toys that use tech in creative ways. the USB Rechargeable Crafty Robot. And don't forget to check out last month's Tech for Kids Crowdfunding Roundup, some projects may still be available to back. Tip: Signup to the Tech Age Kids newsletter to make sure you find out about cool new projects in time to back them. Gazintu is a device that 'goes in to' (get it?) a physical toy and can then be used to trigger interactions with an app. The Gazintu is a small box which contains sensors that are used to recognise gestures that a child makes with a toy. I think we can all imagine that! The app can then be used to activate on-screen behaviours when a gesture is recognised. The idea of having the Gazintu as a box that can be used with lots of different toys is brilliant. Just having a small range of toys with the behaviour would be much more limiting. My kids love their physical toys and their tablets. I can really see them getting a lot of pleasure from bringing the two together. GoBox: The robot kit with a new mission delivered monthly. Note: This project ends on Oct 11th so get it quick if you want to back it. This looks like a great idea for helping kids get started with robotics. The GoPiGo is based on Scratch to make it accessible to kids. The monthly kit will include a new sensor (we love sensors!) plus a mission for kids to complete. Mineserver is a useful gadget that solves a common problem in modern households. It's a mini computer that runs a dedicated Minecraft server for multiplayer access. Kids often want to play on the same server as a group of friends. Parents want to control who their kids play with. Hosting your own server addresses these issues but can be costly and/or tricky to set up. Just buying a box that you can put on the network will be a good option for many families. You also get a custom subdomain of mineserver.com so there's no need to worry about IP addresses. Nibble: Nibble is a mini-arduino computer kit with an OLED screen that can used as a games console or for lots of other purposes. Not specifically for kids, but a good kit for teens. Turtle Mail: A cute wooden mailbox with a mini printer inside. Turtle Mail is wifi-connected and family and friends can send messages from a mobile device or PC. Infento Constructable Ride Ons: Cool kids ride-on system that can be reconfigured as kids grow. Quickdraw Reversible USB charging cable: Kids struggle with getting USB cables the right way round and this clever cable also has a charging indicator LED. The Wonderful World of Creatures & Code: A colourful picture book that introduces HTML tags to little kids. Marbelocity: Wooden marble kit that teach physics and engineering concepts. And finally, check out Open Toys because who wouldn't want to stick 3D printed parts into vegetables to make cool vehicles and animals?